Our Chancel Choir, made up entirely of volunteers, participates in all our Sunday services except during the summer months. While small in number, the choir provides confidence to the congregation to respond with hymns and musical responses to the various movements of our worship services. The Hand Bell Choir regularly enriches the musical component of our worship. It, too, is totally volunteer. Both choirs are always delighted when new people volunteer to participate. At least twice a year, usually around Easter and Christmas, the choirs prepare special programs that enrich the seasons for FPCA members and friends and neighbors. 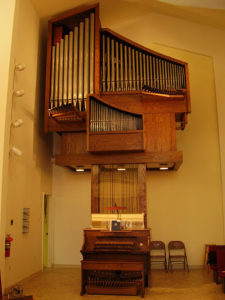 These are occasions when additional voices and/or instruments join our choir (Be sure to see the picture of the Lewis and Hitchcock tracker organ below). Throughout the year, musical groups from the community (including Annandale High School choruses) perform in our sanctuary, which speaks well of our sanctuary acoustics, and of our organ and concert grand piano. Click here to hear a sample of our beautiful music at FPCA!